The Pythagorean (or Pythagoras’) Theorem is the statement that for a right angle triangle the sum of (the areas of) the two small squares formed on the sides of the triangle equals (the area of) the big one. 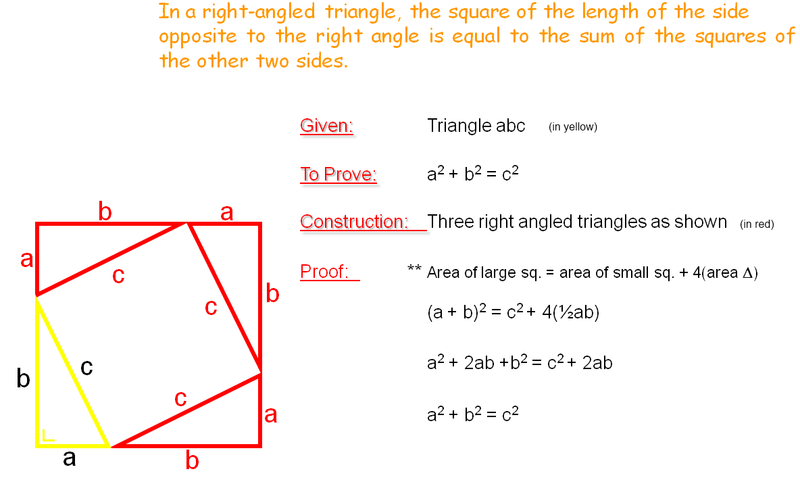 In algebraic terms, a² + b² = c² where c is the hypotenuse while a and b are the other two sides of the triangle. The theorem is of fundamental importance in Euclidean Geometry where it serves as a basis for the definition of distance between two points. (See your text books in the chapter “Coordinate Geometry”). using algebra. I like this one. If you prefer an even easier picture to remember but a bit more algebra you could use Heron’s formula to prove Pythagoras’s theorem. It is the last formula on page 9 of the Formulae and Tables booklet and gives the area of a triangle as √(s(s-a)(s-b)(s-c) where s is half the length of the perimeter and a,b and c are the lengths of the sides. Take an isosceles triangle made of two congruent right angled triangles as shown. Below this line only for those that are particularly interested and have lots of time to spare. If just want to pass exams ignore beyond this point. Click here for a collection of 96 approaches to proving the theorem. Many of the proofs are accompanied by interactive Java illustrations. Fortunately you do not need to know all these. This is only shown to drive home that there can often be more than one right way to answer a question. For exams you only need to know the ones in your school text books.